Duley's Electric Communications Site Services Inc.
We will be glad to assist you in the use and purchase of this product. 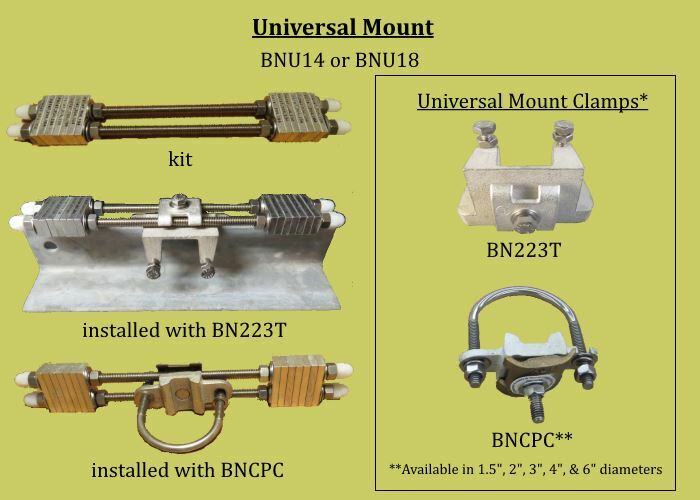 *Universal Mount Clamps must be ordered as separate parts (part # BN223T and BNCPC). Kits are recommended to ensure proper hardware. All BarNone kits use 12" stainless steel threaded rods except for BNWB08 and BNWBC08. These use 8" stainless steel threaded rods. Belleville washers are used to reduce stress on stainless steel threaded rods and nuts.